Japan  2004  97m   Directed by: Kazuya Konaka. 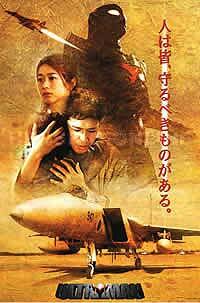  Starring: Tetsuya Bessho, Kyôko Tôyama, Ken'ya Ohsumi, Nae, Ryohei Hirota, Toshiya Nagasawa, Daisuke Ryû, Masao Kusakari, Thomas Lynch, Dana Segal.  Music by: Tak Matsumoto. Two deadly emissaries from the planet Monera have arrived on Earth with global destruction on their minds -- the giant robot Deathfacer and a huge and terrifying monster known as Queen Monera. As the international monster-defense league Super G.U.T.S. (Global Unlimited Task Squad) tries to plot a proper response to this two-pronged attack, two of the world's greatest superheroes join forces to help them meet the menace -- Ultraman Tiga and Ultraman Dyna. If you were a kid who grew up in the 70's or 80's, you've probably heard or seen something about the superhero character known as "Ultraman", the silver and red colored hero who battles skyscraper sized monsters in Japan, all while using Martial Arts moves and keen looking powers, very similar in the tradition of the Godzilla franchise. The only major difference is that "Ultraman", in his many different guises or series (Ultraman, Ultra Seven, Ultraman Gaia, Ultraman Tiga, etc. ), is always the 'good guy', with the huge, ugly looking monster to be touted as the 'bad guy', and not somewhere in between like Godzilla, who can either be a 'bad guy' or a 'good guy' depending on the particular movie he appears in. The "Ultraman" series (movie as well as television) has always been about good versus evil, with the titular character being on the side of good, usually defending the Earth (in whatever universe it may be in) against a rampaging monster. In true tradition of the "Ultraman" franchise, this movie, simply titled "Ultraman" (or "Ultraman Next") is a re-telling of the original 1960's series storyline, similar to the re-telling of the Batman film franchise with the film "Batman Begins". From the typical 'good versus evil' standpoint, "Ultraman" 2004 sets its sights on not only a younger audience, but a teen, young adult and adult audience as well. Immediately, the younger audience will be dazzled by how Ultraman makes his dramatic appearance in this film, whereas teens, young adults and adults will feel a bit of nostalgia from seeing one of their favorite heroes get called back into a visually updated and re-designed character and premise. Unlike the old television series and movies, where the shows or movies play out like an episode of "Power Rangers", complete with sci-fi based settings and vehicles, this particular "Ultraman" film takes place in a universe much like our own, where beings and things like "Ultraman" should not exist and are not really ready to be accepted. Like "Batman Begins", "Ultraman" (or "Ultraman Next") is believable in a sense where it just might be realistic enough to actually happen, if there were actual forces that exist in the universe who are willing to interfere with and ultimately defend the well-being of this galaxy's inhabitants. Sure, this movie still has the 'guys in the rubber suits', then again, so do recent superhero films like "Batman Begins", "Fantastic Four", "X-Men 1 & 2", "Daredevil" or "Spider-Man 1 & 2". Those movies made the comic book superheroes look and seem realistic enough to be accepted as live action film counterparts, and "Ultraman" definitely takes the ball and puts it into play, right up there with the big, Hollywood produced superhero films. Of course, Japanese film companies usually don't invest too much into films of this genre, as they don't want to invest millions upon millions that American film companies do, because their audience is primarily Japan, whereas Amercian produced films have the entire world in mind when their films are made. Still, the production values in "Ultraman" are quite high and easy to see, especially in how serious they made the storyline as well as the character designs for this film. There isn't too much excessive blood or violence, but it does appear when it's necessary to the storyline. I would have to say that this movie would fall under the "PG" film category if this film were to be released stateside. Unfortunately, there are currently no plans to bring an American theatrical, let alone DVD release of this film. Your only chance in seeing this film would be to rent it from a video store which specializes in foreign films (probably not possible to rent from a place like Blockbuster or Hollywood video) or to purchase it directly from a place which allows importation of Japanese DVDs. This was definitely worth the viewing, especially if you're a fan of the original Ultraman TV shows or movies. Review by S_Forgel from the Internet Movie Database.